MSG will be airing the debut of Rex & Rob Reunited tonight. While the premiere will air in Buffalo and Rochester on Saturday night at 8:30 (Part 1) and 9 pm (Part 2), there will also be a nationwide airing wherever else MSG is carried. MSG outside of Buffalo and Rochester will air Rex & Rob Reunited at 10:30 pm (Part 1) and 11 pm (Part 2). He’s not the first Bills free agent signee to get a recommendation from Assistant head coach/Defense Rob Ryan. There have been others this offseason. But after having him play under him when he was defensive coordinator for three years, it was easy for Ryan to give his twin brother and the personnel department a full report on LB David Hawthorne. 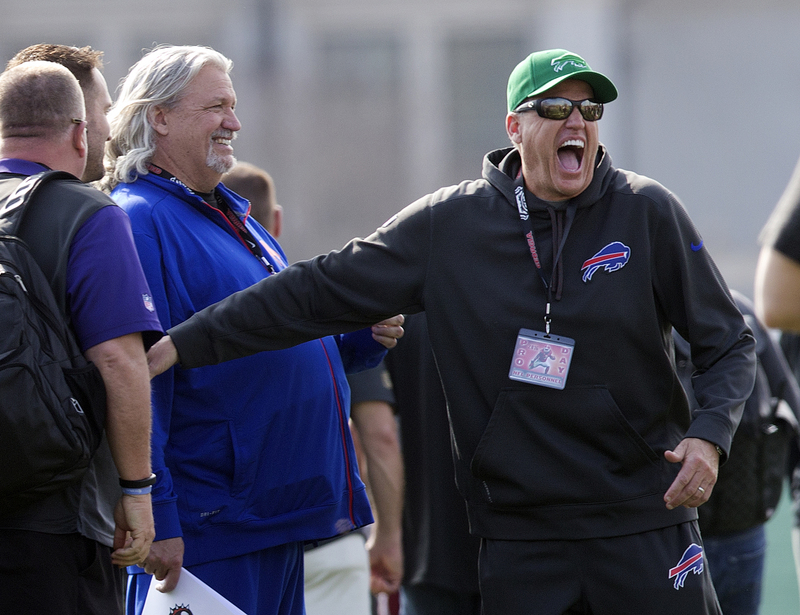 Bills head coach Rex Ryan outlined how Hawthorne was given the Rob Ryan seal of approval. Ryan said there’s plenty of carry over between his defensive scheme and the system his brother ran in New Orleans, so he’s optimistic that Hawthorne will feel comfortable in the Bills system in short order. Rob Ryan has also recommended free agent signees Corey White and Sterling Moore, now cornerbacks in Buffalo’s secondary. He’s wheelchair bound due to his affliction. Jack Frost III has Fanconi anemia, which is a rare inherited disease characterized by multiple physical abnormalities, bone marrow failure, and a higher than normal risk of cancer. 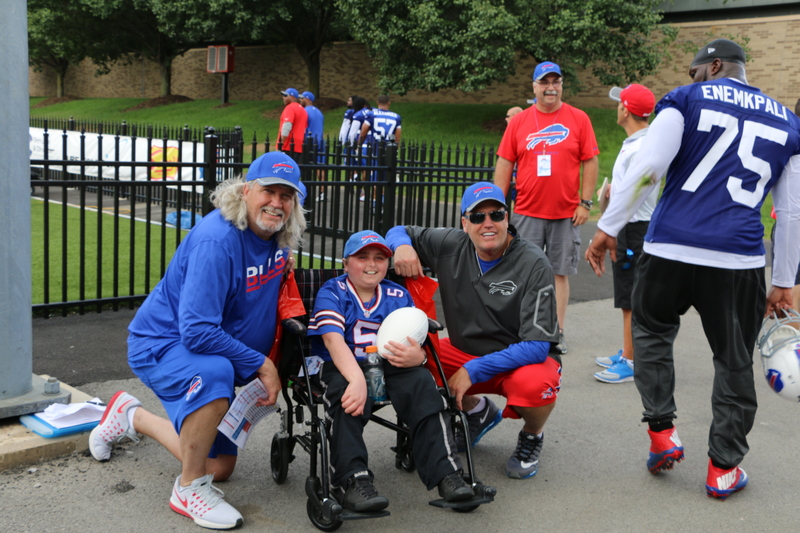 But that didn’t stop him from meeting the Ryan brothers at Bills training camp Sunday. His first question for the Ryans? The young boy, who has had multiple bone marrow transplants has a ton of spirit was wearing a Tyrod Taylor jersey hoping to get the QB’s autograph, but he didn’t mind at all that Rex and Rob Ryan signed for him. As we profiled on Buffalobills.com today, one of the main reasons Corey White was signed by the Bills was because of Assistant head coach Rob Ryan’s familiarity with the cornerback. He coached him in New Orleans for three seasons and says there’s a lot to like about the veteran DB. In a recent appearance on the John Murphy Show, Ryan explained what he likes about White’s game and why he thinks White will like playing in Buffalo’s defense. When Rex Ryan was hired as Bills head coach he said it was his last stop. It was and is his intention to coach here for a number of years, be very successful and retire. Now with his brother Rob Ryan on board as Assistant head coach/ Defense he shares that approach. “This is his 20th season, or something like that,” said Rob Ryan of his brother Rex’s coaching resume’. “Mine the same way. Every time you move, you want it to be the spot that you can finish your career, have your 10 great years and then go out on your own terms. That’s what he wants to do here. That’s the vision here. Last week in an interview with SI.com Bills Assistant head coach/Defense Rob Ryan said he was stripped of control in running the New Orleans defense where he served as defensive coordinator last season. Saints head coach Sean Payton denied the claim. Now a former Saints defensive lineman has come to the defense of Ryan, saying the Bills assistant absolutely had his decision making power on how the defense was to be run taken from him. Chicago Bears defensive lineman Akiem Hicks, who played for the Saints last season, told Chicago reporters this week that Rob Ryan was in fact stripped of decision making concerning the team’s defense. The Saints finished last in the league in defense in 2015. Bills second-round pick Reggie Ragland played in a defensive scheme at Alabama, that GM Doug Whaley claims will have a lot of carry over to Rex Ryan’s scheme in Buffalo. That will hopefully translate into a shorter learning curve for the physical linebacker. Either way Ragland is altogether anxious to get to work on the scheme with both head coach Rex Ryan and Assistant head coach Defense Rob Ryan. Before his pre-draft meeting with the Bills in Orchard Park, Alabama LB Reggie Ragland ran into Bills head coach Rex Ryan and Assistant head coach Rob Ryan in a chance meeting a month before the draft. Appearing on Bills flagship station WGR Sportsradio 550, Ragland said he ran into the two coaches in Birmingham, Alabama of all places. On his pre-draft visit Ragland said he got a good vibe from Buffalo’s head coach and is encouraged to be playing for a defensive mind like Ryan. Wednesday was Georgia’s pro day and Bills head coach Rex Ryan and Asst. head coach/Defense Rob Ryan were on hand for the workouts. One of the prospects who improved on his combine workout numbers was OLB Jordan Jenkins. Jenkins, who has experience in a 3-4 defensive scheme, improved his 40 time running a 4.76 (down from 4.8), his broad jump 10’3″ (up from 10’1″), his vertical leap 38″ (up from 36 1/2″) and his bench press posting 19 reps (up from 16). Jenkins is projected as a third or fourth round pick. Bills head coach Rex Ryan and Assistant head coach/Defense Rob Ryan have been checking out some of the more notable college pro days during this pre-draft season. Today they took in Georgia’s pro day in Athens. Among the more notable Georgia draft prospects are OLB Leonard Floyd, OT John Theus, OLB Jordan Jenkins, WR Malcolm Mitchell and RB Keith Marshall. Here’s a look at OLB prospect Jordan Jenkins running his 40 today. Senior Bowl on Saturday and Pro Bowl on Sunday with three Bills participating. As for today let’s get to your questions from email at AskChris@bills.nfl.net and on Twitter at @ChrisBrownBills for this week’s edition. 1 – @ChrisBrownBills Reported that DeMario Davis, ILB for the #Jets is set to hit FA. Had down yr, but excelled w/ Rex. Top FA target? CB: Yes, I did see that. According to the reports the Jets intend to re-sign Erin Henderson instead of Davis. To me they’re not all that different. Henderson is just two years older and will likely come cheaper. Most NFL scouts see Davis as a two-down linebacker. As you mentioned he had a down year and struggled when put in coverage situations. Personally I think Nigel Bradham is a more versatile linebacker. As Doug Whaley said, they’re looking for dust settle guys. If Davis goes untouched through the initial wave of free agency, which is certainly possible, and his price isn’t exorbitant then he could be an option. 2 – @ChrisBrownBills is there still a working group studying long-term stadium options for the Bills? What’s the latest? CB: To my knowledge the New Stadium Working Group still exists, but I will reiterate what Bills President Russ Brandon shared at the Prospectus Premiere event Thursday night about the prospects for a new stadium. He essentially said at this time there are no planning meetings, no land grabs and no feasibility studies taking place. The Bills have a lease that runs until 2022 and the state and county just invested a sizable amount of money into renovations to Ralph Wilson Stadium. If you remember the New Stadium Working Group was quickly assembled in the wake of Mr. Wilson’s passing because the future of the franchise in Buffalo was uncertain. The NSWG would need to have answers in the event that a new owner sought to relocate the team during the one year opt out portion of the lease in 2020 to help convince the new owner to keep the team in Buffalo. Once the Pegulas successfully purchased the Bills that threat went away. Terry and Kim Pegula are committed to the city and keeping the team here. So the urgency to map out a future home for the Bills just isn’t there at this time. 3 – @ChrisBrownBills do you think the hiring of Rob Ryan will benefit the Bills or just lead to another rebuild? CB: Here’s why I see the addition of Rob Ryan as a benefit. Rex implicitly trusts his brother in every facet of football. With Rob as Assistant head coach/Defense, Rex will be able to focus more on the big picture responsibilities of being a head coach. Rex can hand the reins of the defense to his brother and defensive coordinator Dennis Thurman during the course of the week and on Sunday Rex can still call the plays. I also believe Rob will serve as an added motivator for Rex. Both of them are very disappointed with how their 2015 seasons went with respect to defensive performance. Putting the two of them together will only inspire them more to redeem themselves in 2016 with Buffalo’s defensive unit. 4 – @ChrisBrownBills What’s the better option? WR in free agency or the draft? CB: Here are the things you need to consider when assessing whether the Bills sign a receiver in free agency or acquire one in the draft. First, where is receiver on their positional priority list? Sure Doug Whaley would like to add a bona fide No. 2 receiver to work opposite Sammy Watkins, but that comes at a price when dealing with free agents. I think the steps we’ve seen the Bills take already at receiver signing Greg Salas, Jarrett Boykin and Greg Little is similar to that of their approach at quarterback last year. Create a competitive environment and hope you can strike gold with a player stepping up and filling a role at a very affordable price. All three of those players bring size to the equation, which is another element that Buffalo is looking to add to their receiving corps. The free agent class at receiver is limited at best. Free agents, who are likely to still be available when the dust settles are players like Rishard Matthews, Brandon Gibson and Darrius Heyward-Bey. They are not going to be names that excite you. So Buffalo took the proactive approach and signed a few reserve/future free agents in Salas, Boykin and Little in the hopes that one emerges. Now one of those guys might not be the true No. 2. Heck, I think Robert Woods is probably better than all of them. But if Woods can work primarily in the slot opposite Charles Clay and one of the three aforementioned wideouts can prove they deserve the job outside opposite Sammy Watkins you could be in business. Is that a big ‘if’? It most certainly is, but with a tight cap situation, two starting offensive linemen to re-sign and some holes to fill on defense that might be the only realistic course to take. I know this is a long way of saying it, but if the Bills are going to add any more talent at receiver it’s probably coming via the draft. My question is about the future of Stephon Gilmore. I understand he is under contract until the end of next year, but after that do you think they’ll extend him? He is going to want top 3-5 CB money. If we can sign Glenn and need a huge contract for Taylor, where is this money coming from to sign a top 3 CB? Not to mention there is no way to sign Gilmore and Darby if he continues to play at this level. The way I see it, is the writing is on the wall with Gilmore. He plays out next year, wants top 3 money and there will be a team willing to give it to him. With his replacement on the team. I see this as his last year with Bills!! Thoughts? CB: I wouldn’t throw in the towel on Gilmore being gone after 2016 just yet. By picking up the fifth-year option on Gilmore they’ve given themselves time to address his contract long term. The average salary of the top cornerback contracts is just over $11M per season. I don’t debate that it will be a sizable investment to keep him long term. You’re right Tyrod Taylor will be the other big contract. The thing with Taylor’s contract and Gilmore’s is you can spread the money out over a six or seven-year period, which lessens the blow to the team’s cap. Also helping is the fact that the salary cap is going up at a rate of close to $10M per season with the revenue continually pouring in. Add in the fact that the only other notable contracts that will be up in 2017 are Robert Woods and Manny Lawson, who will be 32-years old at that time, and it’s reasonable to think you can get Gilmore and Taylor done. Darby is a player you don’t have to worry about until 2019. The Bills made a notable addition to their coaching staff in the form of Rob Ryan, head coach Rex Ryan’s twin brother over the weekend. On Monday, Buffalo’s sideline boss commented on what adding his brother to the staff will mean for the Bills. Appearing on ESPN Radio’s Mike and Mike show, Ryan believes their staff has gotten a lot better with his brother as Assistant head coach/Defense. Late in the preseason this past summer, the Bills were hard up for help at linebacker heading into their final preseason game with LB Tony Steward out with an MCL injury and Buffalo having no interest in playing their starting LBs in the game. So they claimed Kevin Reddick off waivers two days before the game and Reddick had a crash course in Buffalo’s defense that included a walk through in the team hotel the day before the game. Fortunately for him he had an edge. Reddick admits that Rex has his own tweaks on the scheme so it’s far from identical to his brother Rob’s scheme, but there were more than enough common concepts that carried over. Reddick’s performance in the preseason finale impressed Ryan enough to add the linebacker to his team’s practice squad just a day after final cuts. Other positional needs prompted his release from the practice squad in the middle of the season, but injuries at linebacker has him back and on the 53-man roster. As proud as Reddick was to play well on short notice back in the preseason finale knowing it impressed Rex Ryan, he still feels there was another reason he was kept around and subsequently brought back last week. Reddick caught up with Rob Ryan, who was visiting at One Bills Drive this week. Bills head coach Rex Ryan learned late Monday that his brother had been fired as defensive coordinator of the Saints. Ryan was asked about his brother Rob Ryan and his current situation. When asked if he would consider bringing him on to his staff, Ryan didn’t dismiss it. Jets head coach Rex Ryan and his team are coming off the bye as they begin preparations for the Bills on Sunday. Ryan spent part of his bye week in New Orleans seeking further intel on the Bills from his twin brother Rob Ryan. A team’s offense and defense can morph and change over the course of a season, so Ryan was likely checking with his brother to see what ways Buffalo’s offense and defense may have changed since he initially faced them in Week 3. Rob Ryan is the Saints defensive coordinator, who brought a lot of pass pressure down on QB Thad Lewis making him unavailable for the game the following week in a 35-17 win over the Bills. Rex Ryan faced EJ Manuel in his first road start back in Week 3 and also dialed up a lot of pressure and his team got eight sacks in a 27-20 win. Although Ryan is 7-2 against the Bills as Jets coach, his teams are 1-3 coming off the bye. He gave his players six straight days off last week.